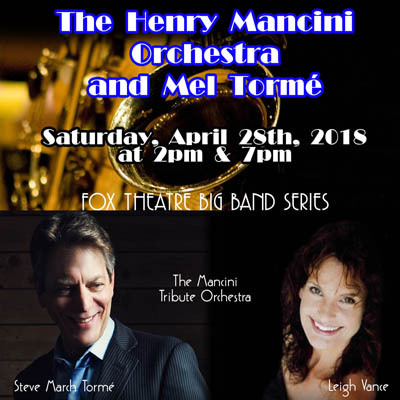 Some of the biggest instrumental recordings of all time will be played by the Mancini Tribute Orchestra including “The Pink Panther Theme”, “Days of Wine & Roses”, “Moon River” and “ Peter Gunn Theme”. Widely regarded swing and jazz vocalist Steve March-Tormé will perform his father’s most famous recordings such as “The Christmas Song”, “Lullaby of Birdland”, “Lulu’s Back in Town” and many more! Singer Leigh Vance has performed with several big bands and will sing some of Mancini’s most popular songs.